This weeks book review is very near and dear to my heart as it is penned by my dear friend and fellow blogger, Mia! Mia has been writing for years and has slowly begun to send out feelers into the publishing world. She has completed the first draft of a YA novel and also self-published this book of short stories on Amazon as she looks for representation for her novel. 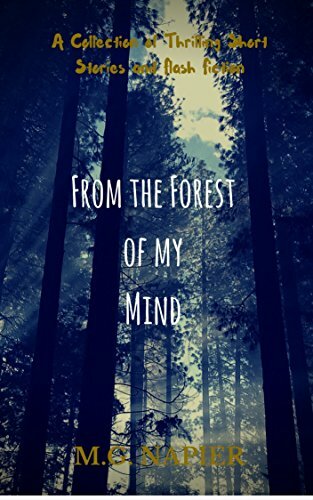 From the Forest of My Mind is a book of flash fiction, equal parts thriller, suspense, and horror. Broken into 15 short stories, each tale traces back to a cursed picture frame, weaving destruction and heartbreak through the lives of everyone who's path it crosses. From the moment the small antique portrait was gifted to 10 year old Lucy, nothing but death and destruction have followed. This book has so many hidden gems within each story tying it in some way to all the rest with precision. I read the book multiple (ok... at least six times) and continue to catch small details that I had previously missed, making different connections between characters and events. If you are in the mood for a quick read (flash fiction guys) that will really stimulate the mind, this one is a no brainier. Check it out here and let us know what you think!